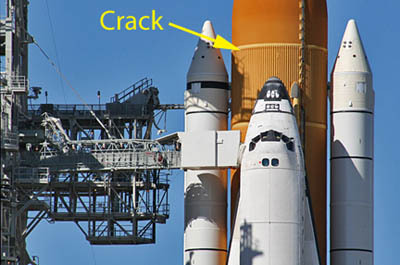 Cracked foam insulation on the shuttle Discovery's external tank was cut away overnight, revealing serpentine cracks in an underlying structural rib, or stringer. Based on experience repairing similar cracks on other tanks, sources said, engineers believe the damage can be fixed at the pad before the next launch window opens at the end of the month. Working in parallel, another team of engineers is continuing work to disassemble a leaking hydrogen vent line quick-disconnect fitting that delayed Discovery's planned launching last Friday. Replacement hardware is expected to be installed by the end of the week, but it's not clear when testing and analysis to pin down the cause of last week's leak will be complete. In any case, NASA managers are expected to order a tanking test to make sure the new hardware is leak free before moving forward with another countdown, sources said. And that assumes the crack repair work goes well. To minimize the impact of a fueling test on other pad operations, only liquid hydrogen would be loaded into the external tank's lower section to confirm the replacement vent line attachment is working properly. Taking advantage of the launch delay, engineers also plan to replace a circuit breaker panel in Discovery's cockpit that may have played a role in a subtle electrical glitch that triggered a delay earlier last week. Panel L4, equipped with 18 replacement breakers, is expected to be re-installed in the cockpit by early next week. The crack in the external tank's insulation occurred just after 7 a.m. EDT Friday, about an hour into the fueling procedure and shortly before the hydrogen leak was detected. The crack, located near the top of the ribbed intertank section that separates ET-137's liquid oxygen and hydrogen tanks, is similar to a backward question mark, measuring 46 inches from end to end. Overnight, engineers at pad 39A cut away the foam insulation in the area of the crack, revealing underlying cracks in a structural stringer that is part of the vertical ribbing that makes up the intertank section. The cracks appear to run in a wavy line from bolt to bolt in the stringer. It is not yet clear what caused the underlying cracks. They presumably could have been triggered by temperature-induced stress as the tank was loaded with supercold liquid oxygen and hydrogen rocket fuel. 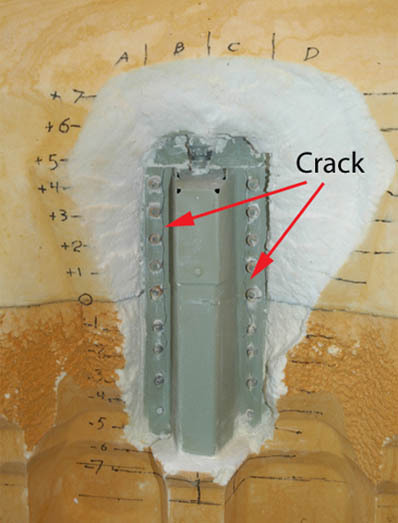 But a similar crack was found in ET-138, scheduled for use by the shuttle Atlantis next summer, and that tank has not yet been subjected to cryogenic temperatures. 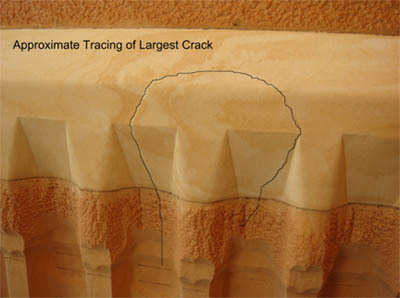 The cracks may be related to the use of lightweight materials in the latest generation of tanks. The crack in Atlantis' tank was repaired and engineers likely will follow a similar approach with Discovery's tank, possibly installing so-called doublers to reinforce the damaged stringer or a replacement section. Assuming management clearance to proceed and no other problems, fresh foam will be sprayed on, cured and sanded to match the surrounding insulation. The year's final shuttle launch window opens Nov. 30 and closes Dec. 5 or 6. If Discovery is not off the pad by then, the flight will slip to the end of February because of conflicts with other space station missions; a prohibition against flying over New Year's to avoid possible year-end rollover issues with the shuttle's software; and because of temperature constraints related to the space station's orbit. Whether Discovery's launch team can complete the leak repair and fix the crack damage in time for a Nov. 30 liftoff is not yet known, but engineers are cautiously optimistic. The schedule is considered "success oriented," however, and there is little margin for error.